· When flagged, all the incoming and outgoing mails from mailenable are saved.The software organizes mails dividing them in folders according to the date of sending or of receipt of them. Consequently we have a new folder called “2005” for mails sent and received in 2005; inside that folder there’ll be another one with the month number (1-12) and, inside that, another folder with the day number (1-31). · You can select the folder where you want to save the mails. 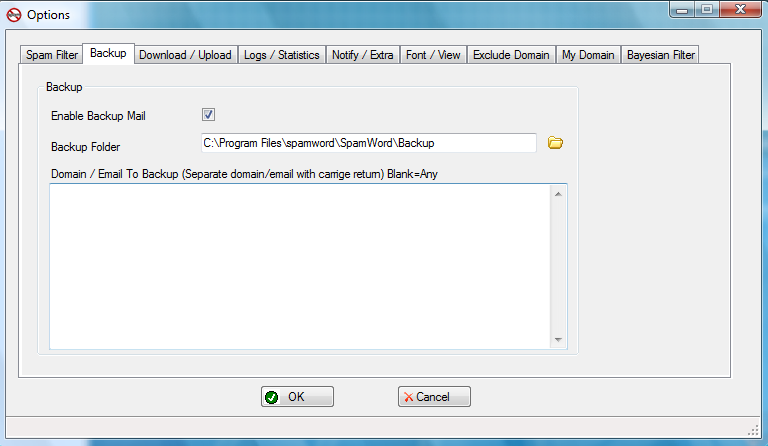 If you don’t specify anything, mails will be saved in the default folder: SpamWordBackup. · Here you can specify domains and/or mails that you want to backup. If you don’t specify any domain, the system will save all the mails in transit from mailenable.